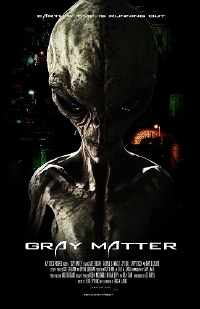 Indican Pictures is premiering the first trailer for their new sci-fi thriller, Gray Matter. The film, which sees release in May, hinges on the concept that maybe we've been wrong about "Greys" all along and they've been visiting earth since the 1940's in order to monitor and protect us. It's a cool concept and the trailer makes the indie look like a ton of fun. It's at once modern, but also contains moments reminiscent of classic sci-fi films of the past like The Blob. After a meteorite crashes to earth awakening the extraterrestrial creature within, a young woman is abducted by an alien "GRAY" to aide in hunting down and destroying the creature before it can reach a second meteorite that fell to earth decades earlier unleashing its deadly infestation of earth. Gray Matter is written and directed by Greg A. Sager (Devil Seed) and stars Alys Crocker.